I was born and raised in the Midwest, and became interested in creating art when I refinished an old oak dresser at the age of 13. I graduated from high school, married and became a parent at the age of 20. During the years of raising my children I always found ways to explore my creativity from sewing clothes for myself or my children to quilting. In my late 30’s I received a BA in Business and MSW in Social work. I retired early and joined the Peace Corps 2008-2009 where I taught English in Romania. Art supplies were hard to find, but my students did create Haiku poetry and art for a display in our school. This display was one of the examples used when Romania applied for entrance to the European Union. After I returned from Romania in 2009 I began to focus on my art. Although I am mostly a self-taught I have taken encaustic classes with Ellen Koment, Paula Roland, and Harriette Tsosie. I studied oil painting with Dreama Tolle Perry and also taken online classes in acrylic. I learned to work in ink and resin classes from Jane Monteith. I also work as a docent in Albuquerque Art and History museum. In addition, I was the educational director for the Encaustic Art Institute, demonstrating with a Roland Hot Box in high school art classes in Albuquerque Public Schools. I have been a member of Yucca Art Gallery in Old Town for the past six years and contributed by helping with publicity, social media, organizing the airport display, wall curator and events coordinator. I am an experimental painter who explores oil, acrylic, ink and resin. In my work I combine the world I see with my imagination. The results are semi-realistic images that often feature landscape, figurative and symbolist elements. My work is intuitive since I create as I paint. Sometimes the inspiration for a painting is a place that I have visited or hope to visit one day. I am inspired by the abstract yet figurative works of Cathy Hegman and Dan McCaw. I like the transparent application of oil paint by Dreama Tolle Perry. 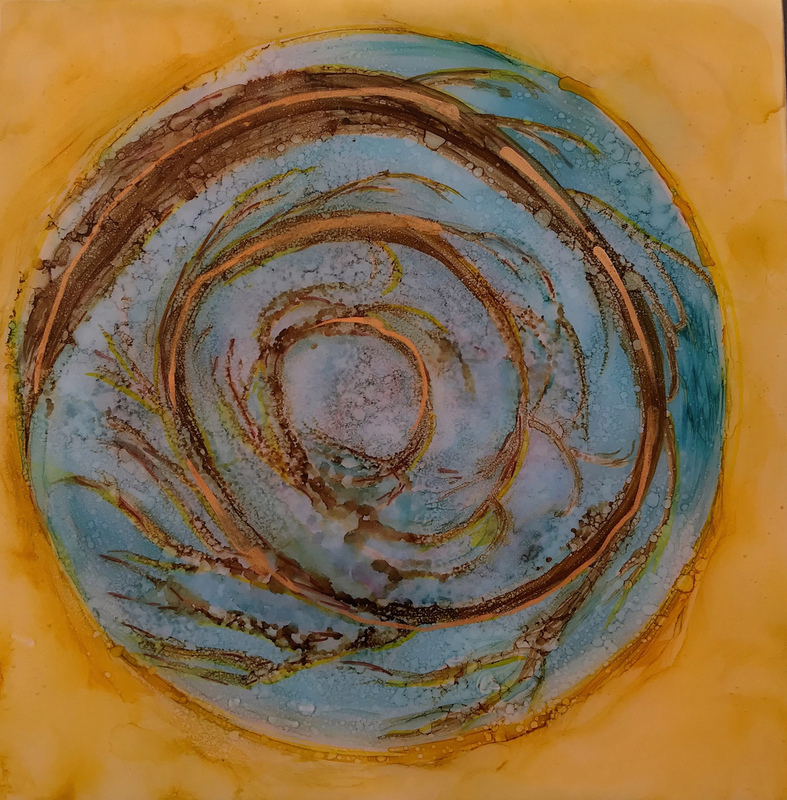 I have taken encaustic classes from Ellen Koment and Paula Roland in Santa Fe, and cold wax and oil from Rebecca Crowell. For each painting I select the medium that best suits the subject matter and idea I am pursuing. I am always curious to experiment with new techniques, such as incorporating photography or collage, or new ways of mark making. I like to introduce humor both in the painting and the title selection. For instance, a coyote in a suit with a bow tie is titled “Guess Who Came to Dinner.” Most often I arrive at the title as I am painting and then sometimes before I begin, which gives direction to the piece. Sometimes the finished piece works and sometimes is does not. All is part of the creative process. Most importantly I am happiest when creating art and I hope to convey this joy to those who view my work.